One of the first satyagrahis in the movement of 1906-14 in South Africa and a most loyal and courageous colleague of Gandhiji was Govindasamy Krishnasamy Thambi Naidoo.1 Apart from defying the law and going to jail many times, he made a crucial contribution in mobilising the Tamils in the Transvaal to participate in the satyagraha and the workers in Natal to strike for the abolition of an unjust tax which caused enormous suffering. He went to South Africa with his sister and brother and started business in Kimberley, centre of diamond mines, in 1889 when he was 14 years old. He moved three years later to Johannesburg when gold was discovered in the Transvaal. He started hawking fresh produce, set up shop on Bree Street and gradually expanded his business into that of a produce merchant and wholesaler. He also became cartage contractor. He led a deputation to Johannesburg Municipal Council when he was only 19. He was in a deputation to see President Kruger of the South African Republic and present a petition concerning the Law of 1885. He collaborated with Gandhiji, when the latter settled in Johannesburg after the Anglo-Boer War, in resisting anti-Indian measures. He became a member of the executive of the Transvaal British Indian Association of which Gandhiji was secretary. When the satyagraha started in earnest in July 1907 with the picketing of registration offices, Thambi Naidoo was the chief picket in Johannesburg. He was arrested and served 14 days` imprisonment. On December 28th that year he was charged with Gandhiji for refusing to register and ordered to leave the Transvaal within 14 days.7 On January 10th, 1908, he was sentenced with Gandhiji for disobeying the order. He did the cooking for the nearly two hundred fellow prisoners in the Johannesburg prison. At the end of January, an agreement was reached between Gandhiji and General Smuts, Minister of the Interior, and the prisoners were released.8 It provided for voluntary registration rather than compulsory registration. Gandhiji understood that the Government would repeal the Asiatic Act when the Indians and Chinese registered voluntarily. Almost all Indians registered voluntarily, but Smuts denied that he had promised to repeal the Act and negotiations between Gandhiji and Smuts to find a solution failed.. The Indian community then held a mass meeting at which the registration certificates were thrown into a large cauldron and burnt. Satyagraha resumed. Thambi Naidoo repeatedly defied the law and went to prison. While the Satyagraha continued, he never thought of personal affairs, but only of the struggle. “When ‘the old offender,’ Mr. Thambi Naidoo, the Tamil leader, was sent to prison for the third time, to do ‘hard labour’ for a fortnight, Mr. Gandhi suggested that we should visit the sick wife together. I assented gladly. On our way, we were joined by the Moulvie and the Imam of the Mosque, together with a Jewish gentleman. It was a curious assembly, which gathered to comfort the little Hindu woman in her home - two Mohammedans, a Hindu, a Jew, and a Christian. And there she stood, her eldest boy supporting her, and the tears trickling between her fingers. She was within a few days of the sufferings of motherhood. After we had bent together in prayer, the Moulvie spoke a few words of comfort in Urdu and we each followed, saying what we could in our own way to give her cheer. It was one of the many glimpses, which we have lately had of that divine love, which mocks at boundaries of creed and limits of race or colour. It was a vision of Mr. Gandhi’s ideal”. “Before the movement commenced Mr. Thambi Naidoo was a self-satisfied trolley contractor earning a fat living, and was a happy family man. Today, he is a proud pauper, a true patriot, and one of the most desirable of citizens of the Transvaal, indeed of South Africa. His one concern, whether in jail or outside it, is to behave like a true passive resister, and that is to suffer unmurmuringly”. “... Mr. Thambi Naidoo has given up smoking, tea and coffee for ever, though, before he went to jail, he could not do without any of these things even for an hour. He has, moreover, pledged himself not to allow his moustache to grow so long as the struggle is on”. Veerammal was a cook in the Farm; Thambi Naidoo was in charge of marketing and sanitation; and their four younger children carried water from springs almost a mile away. Satyagraha in the Transvaal was suspended in 1911 after a provisional agreement between Gandhiji and General Smuts. But the government did not implement the agreement. Meanwhile, the Cape Supreme Court declared marriages performed according to religions which allow polygamy – such as Hinduism, Islam and Zoroastrianism - were not valid in South Africa. That judgment had serious repercussions as most Indian women became legally no more than concubines and their children became illegitimate. The government ignored appeals for legislation to remedy the situation. Gandhiji decided, after consultation with his associates, to invite women to join the satyagraha. At the same time, the three pound tax which was levied on workers in Natal who had completed indenture, and their wives and children, was causing so much suffering that action had to be taken to secure its abolition. It was, therefore, decided to persuade Indian workers to go on strike until the tax was abolished. Members of the Thambi Naidoo family, including his wife and mother-in-law, were among the seventeen Transvaal women who volunteered to go to Natal, explain the three pound tax to the workers and persuade them to strike. Thambi Naidoo led the women and went from mine to mine to persuade the coal miners to suspend work. After the women were arrested and sentenced to three months in prison with hard labour, he continued organising the strike of workers in plantations, railways, municipalities and other locations. He marched throughout Natal addressed huge meetings without any rest and often without food. He addressed a mass meeting of four or five thousand people in Pietermaritzburg in November and it adopted a resolution calling for a general strike the next day. Workers in sanitary, hospital, electricity departments were, however, requested remain at their posts. He was later released in Durban and continued with his work. Natal saw the biggest general strike in its history while Gandhiji was in prison. The strike, and the fearlessness of the workers despite brutality by the employers and the army, helped persuade the government to release Gandhiji from prison, negotiate with him and sign an agreement acceding to the main demands of the satyagraha. Thambi Naidoo spent a total of fourteen terms in prison during the satyagraha. Seventeen members of his family were reported to have been in prison at one time. After Gandhiji left South Africa in 1914, Thambi Naidoo continued to lead the Indian community while struggling to make a living. Soon after the end of the Satyagraha, he joined the successful appeal to the courts against segregation in tramways and fought for the removal of the colour bar in the municipal market. As there were renewed attempts after the First World War to harass Indians, he was active in mobilising the people to protest. He was elected President of Transvaal Indian Congress in 1932. He denounced the Transvaal Asiatic Land Tenure Act and the Licences (Control) Ordinance, which added to the disabilities of the Indians and persuaded the TIC to decide in principle on passive resistance. He offered himself and his family to go to jail for the cause. He condemned the decision of the leaders of the South African Indian Congress to join the Colonisation Enquiry Committee, set up by the regime to find ways to induce Indians to emigrate to distant lands like Borneo; from his sick bed in August 1933, and against doctor’s advice, he went to a Conference called by the South African Indian Congress and fought to the end. He also led the fight, early in 1933, for the removal of untouchability at Melrose Hindu Temple. “There were 80 cars in the procession besides the horse vehicle. The funeral procession went through President Street right into the heart of the town. Hundreds lined the street. "With a sturdy physique and brawny arms, he fathered many a weakling and made life in jail easier for him. Thambi Naidoo was always there to finish his own task as well as to help those who lagged behind to finish theirs. During his leisure time he would be reading religious books or singing hymns and keeping gay those who had a tendency of being morose having never suffered jail life. It was indeed a sorry time for those inside prison when Thambi Naidoo was released. But he was never out long. He required no rest. One heard of Thambi Naidoo’s release and within a day or two news flashed once again that he was arrested. This is the life that Thambi Naidoo led from the beginning to the very end of the great struggle in 1914. During the intervals he was the chairman of the Tamil Benefit Society which did a great deal of organising among its own people. During the great strike in 1913 as a protest against the £ 3 tax on Indian labourers, the late Thambi Naidoo played a heroic part. He led the women from Johannesburg and marched from place to place throughout Natal organising strikes without any rest whether by day or by night and often without food. As he was determined so was he fearless”. Thambi Naidoo inspired many members of his family and friends to join the satyagraha. His eldest son Coopoosamy (Kuppusamy) began courting imprisonment soon after he turned 16 in 1909. Narainsamy Pillay, brother of his wife Veerammal, served four terms in prison. In 1913, when women were allowed to join the satyagraha, Veerammal, his mother-in-law Mrs. N. Pillay, and Mrs. Narainsamy Pillay volunteered and each spent three months with hard labour in the Pietermaritzburg prison. Veerammal was pregnant at the time and took her daughter Seshammal with her. She gave birth to a son the day after she was released from prison. Her mother was the oldest of the women satyagrahis. At a farewell banquet to Gandhiji on 14 July 1914, Thambi Naidoo offered Gandhiji his four sons – known as “four pearls of Gandhi” – “to be servants of India”. They were: Naransamy, Barasarthi, Balakrishnan and Pakirisamy. Gandhiji arranged for them to be taken to India and sent to Santiniketan of Rabindranath Tagore until he returned to India and set up an ashram at Kochrab in Ahmedabad in May 1915. There was much sickness in the ashram. Pakiri , in particular, was frequently ill and passed away in March 1916. The other three boys were sent back to South Africa at the request of the Thambi Naidoo family. In the continuing struggle for freedom in South Africa, Naransamy and his wife and children, Barsarathi and Thailema went to prison. Even a grandson of Naransamy was jailed as a student leader. 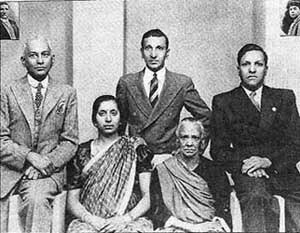 Thambi Naidoo’s family was unique in that for five generations, they sacrificed in the struggle for freedom from racist tyranny in South Africa. Thambi Naidoo was always referred to in Indian Opinion as< C. K. Thambi Naidoo. But an obituary in the Rand Daily Mail (1 November 1933) gave the full name which, I believe, is the correct name. Thambi Naidoo was the second satyagrahi. The first was Ram Sunder Pandit, a priest who left the struggle after a term of imprisonment. Manonmany Naidoo, his daughter-in-law, said that the parents came from Mattur in Tamil Nadu. (The Patriot, New Delhi, 1 October 1988). I have been unable to find information on a Transvaal Indian Congress in the 1890s. C. M. Pillay, a Bachelor of Arts, wrote a letter to Transvaal Advertiser complaining that he had been violently pushed off the footpath. He was apparently mistaken by the Natal Advertiser for Gandhiji, a barrister who was then living in Pretoria. Gandhiji sent two letters to that paper which published them on 16 and 19 September 1893. Mr. Pillay sent another letter to the press on 17 August 1899 and a letter to Gandhiji on December 26, 1897. He signed them as Late Secretary, Indian Congress, Pretoria and Johannesburg. (Gandhi archive at Sabarmati, Serial Numbers 2797 and 3697). 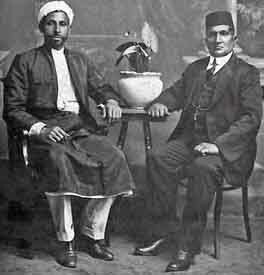 The caption under a photograph of Mr. Ahir Budree in Indian Opinion, 22 October 1913, identifies him as Vice-President of late Transvaal Indian Association. Interview to Ms. Freda Levishon. He told the court that he was a married man with five children – the eldest of whom was 13 and the youngest about 18 months. The letter to Smuts was signed by Gandhiji, Thambi Naidoo and Leong Quinn, the leader of the Chinese community who also undertook passive resistance against the Asiatic Act. Interviews by Ms. Muthal Naidoo and Ms. Freda Levishon with Thailema, daughter of Thambi Naidoo. Mr. Kallenbach, an architect and associate of Gandhiji, purchased the farm. He helped greatly in the satyagraha and served a term in prison. E. S. [Enuga Sreenivasulu] Reddy, a national of India, has been an active supporter of the South African freedom movement for more than half a century. As head of the United Nations Centre against Apartheid for over two decades, he played a key role in promoting international sanctions against South Africa and assistance to the liberation movement, as well as in organising the world campaign to free Nelson Mandela and other political prisoners.